The Dixie Mountain Loop is located in the Southern Area of the Sonoran Preserve in Phoenix, Arizona. The loop begins on the saddle of a ridge at the end of the Hawks Nest trail where it makes a moderate climb around Dixie Mountain and into a semi secluded valley. From there it works its way back around the terrain until it climbs back up the to the ridge where it started out and comes to an end. Enroute it is connected to by the Valle Verde, Dixie Summit, Bobcat, Western Vista and Hawks Nest trails. The loop begins in the saddle of a ridge at the end of the Hawks Nest trail just under a half mile from the trailhead. Trail markers like this one occur every quarter mile and at all major junctions. 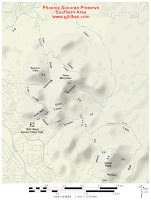 The top area of the marker shows your current position in relation to the two ends of the trail and includes an image of the trails elevation profile. As the trail starts out it heads around the basin below toward another ridge saddle that is on the south shoulder of Dixie Mountain. After crossing the next saddle the trail continues around the east side of the mountain and at the 0.4 mile point from where the loop began it comes to the junction where the Valle Verde trail connects on the right. A half mile on around the side of Dixie Mountain the Dixie Summit trail branches off on the left. That trail is only about a quarter mile long and offers a nice view of the area. From there the trail heads east and makes a big bend around the next mountain. After a half mile the trail has turned back toward the west and makes a long gradual descent into the valley where at the 2.2 mile point from where the loop began it passes its junction with the Bobcat trail. As the trail heads up the drainage it comes to another junction where the Western Vista trail branches off on the right. That trail offers another nice view of the area and only adds about 0.8 miles to the total round trip distance. 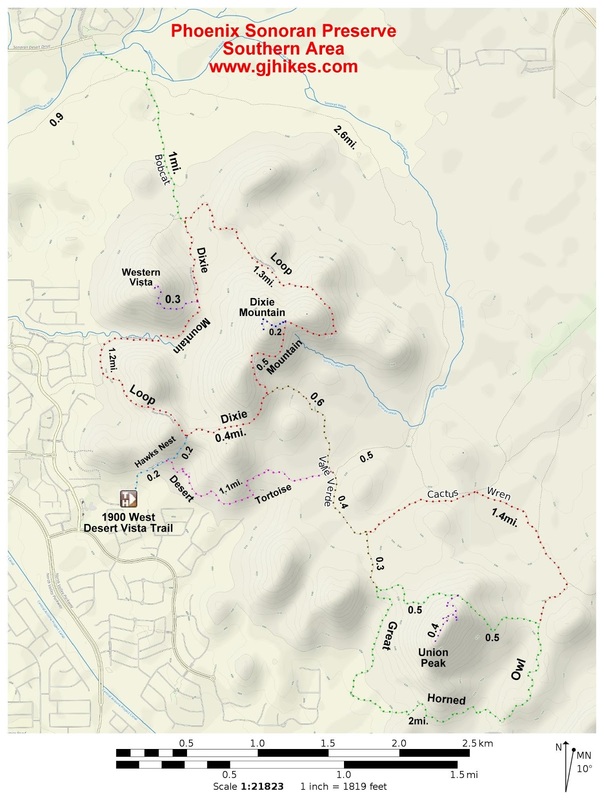 After passing its junction with the Western Vista trail the Dixie Mountain Loop travels around the western side of the Preserve where there are several spur trails that connect to streets in the local neighborhoods. From there the trail starts turning back toward the east as it climbs back up to the ridge where the loop began. The loop comes to an end as it finds itself once again at the top of the Hawks Nest trail where it is just under a half mile of all downhill to the trailhead. Counting the distance to and from the trailhead on the Hawks Nest trail the total round trip distance for the Dixie Mountain Loop comes out to 4.6 miles. There are right at 13 miles of named trails in the Southern Area of the Sonoran Preserve making it a good place to get outdoors. The trails get quite a bit of use from hikers, mountain bikers and trail runners not to mention the occasional person on horseback. As far as the Dixie Mountain Loop goes, if you would like to see it for yourself then all you have to do is grab your bike or 'Take a hike'.